How free trade destroys local economies, hurts small farmers and causes massive waves of migration | Small Farmers. Big Change. In Mexico, there has long been a disregard for and open aggression against the indigenous peoples which dates back to the arrival of Columbus. In recent times, however, no other event has done more to destroy indigenous farming communities, deprive small farmers of their livelihoods, and force hundreds of thousands of Mexicans to risk their lives crossing the U.S. border to look for work than the 1994 signing of the North American Free Trade Agreement (NAFTA). Supporters of NAFTA claimed that by eliminating tariffs on Mexican products, they would be cheaper to U.S. and Canadian consumers. This would help Mexican manufacturers, and in turn would create jobs and strengthen the Mexican economy. 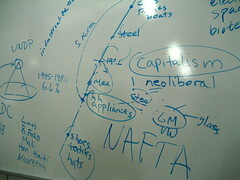 Opponents of NAFTA argued that the effect on small scale farmers would be devastating. Eliminating agricultural tariffs would force small subsistence farmers to compete with U.S. farmers who receive enormous government subsidies and whose technology is far superior. In our meeting at CIEPAC, Gabriela talked about the impact NAFTA has had on rural and indigenous communities throughout the country: “If you take 1,000 U.S. corn farmers, you can imagine that they probably have 1,500 tractors amongst them. Now take 1,000 Mexican corn farmers – maybe they have 10, possibly 15 tractors. How can they compete?” Not only do U.S. producers have technological superiority but they are heavily subsidized by the U.S. government – at around $50 billion annually, while their Mexican counterparts receive approximately $5 billion annually. Fourteen years after NAFTA went into effect, the critics have unfortunately been proven right. Small-scale corn farmers, unable to compete with subsidized U.S. corn entering the country have indeed been losing their businesses. According to the Inter-hemispheric Resource Center, from 1994 – 2004, 1.3 million small farmers went bankrupt. And Mexico went from a country producing almost all its own corn (in 1993), to one which was 42% dependent on foreign corn (2004). Even more sadly, while corn producers are losing their businesses, Mexican consumers are paying even higher prices for corn products such as tortillas – an important staple of the Mexican diet. This is because the corn manufacturing sector is becoming increasingly concentrated by a few transnational corporations that are strong enough to control prices. When I visited Mexico in January 2007, the newspapers were full of stories about riots and demonstrations following yet another rise in tortilla prices. The price of tortillas had climbed 60% since January of the previous year. Altogether, from 2000 to 2006, prices rose somewhere between 180% and 200%. In addition to agricultural and trade policies which favor agribusiness over small-scale farmers, NAFTA also forced the Mexican government to make changes to the country’s constitution (Article 27) that allow the selling off of communal lands or ejidos. For the first time since the Mexican Revolution, land that has been held communally can be parceled off and sold to the highest bidder. This privatization of communal land has dealt a huge blow to indigenous communities. Land which was held communally for generations is being lost – as is an entire culture and traditional way of life for many indigenous communities. Poor farmers, faced with rising food costs, and with no way to make a living, are now offered the “opportunity” to sell their few acres. The small amount of money farmers earn is often what helps them pay a coyote to take them across the border where they face physical danger, psychological trauma, and open hostility in the United States.According to CIEPAC, it has been estimated that before NAFTA, roughly 30% of Mexicans lived in poverty. Today, that amount has risen to 50%. Migration to the U.S has tripled since 1994, as more and more farmers find it impossible to make a living. Each year, approximately half a million Mexicans migrate to the U.S. Last year, that number reached close to 600,000 with all evidence pointing upward. On our side of the border, immigration reform has become a hot topic. Plans for the construction of a 700-mile wall to keep Mexicans out of the U.S will cost approximately $6 billion. There hasn’t been this much open hostility to immigrants in our country for many years. Yet, when we discuss how high to build the wall or how to keep undocumented immigrants from obtaining drivers’ licenses or taking our jobs, how is it possible that public discourse rarely mentions how our trade agreements and agricultural policies are pushing small farmers off the land, away from their families and out of their communities? What do we expect? If you take away someone’s livelihood, and stack the deck heavily against them, take their land and erode their culture, what choices do they have? you seem to forget that the same entities that have destroyed the small farm economy in Mexico had already destroyed the farming economy of the US.